Preparing for various professional health and medicine careers affords students the choice of any major they wish. 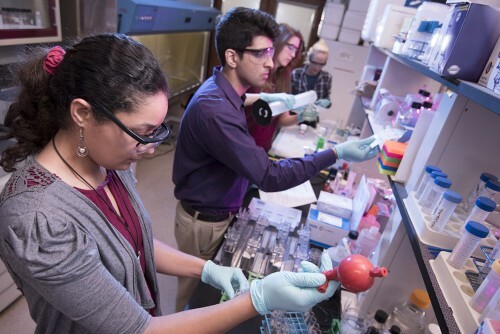 While a majority of students pursue a degree in Biology, Biochemistry, or Chemistry, others with majors as diverse as Mathematics, English, and Music have also been accepted in recent years to medical and dental schools. We advise our students to major in a discipline that they really enjoy, making sure to include the prerequisites for the professional school to which they intend to apply. Required courses include a year of biology, two years of chemistry, a year of mathematics, a year of physics and a year of english. Because of the breadth of fields in all Centenary degree plans, these courses can complement any major. Over the past five years, our pre-med program has a 90% medical school acceptance rate! The pre-medicine program has a long and distinguished history, beginning with the work of Dr. Mary Warters in 1927 and currently serving students, professional schools, and the health care profession as a whole. Not merely limited to preparation for medical schools per se, pre-medicine programs may also be tailored to meet the needs of students interested in a variety of medical fields including dentistry, podiatry, genetic counseling, optometry, biomedical research, and even veterinary medicine. By its very nature, the curriculum for pre-medical programs is difficult and requires steadfast dedication. Our science courses are rigorous and require the development of advanced reasoning skills. In addition, there is ample opportunity to participate in clinical or biomedical research through summer programs with Centenary's faculty or through LSU Health Sciences Center in Shreveport. Applying to both Medical and Dental School requires many steps. Here you will find a complete list of steps and useful links in preparation to apply.